#472 FATAL MAULINGS BY PIT BULL...WHO WILL BE NEXT ? The inconsolable father of a 9-year-old Long Island girl mauled to death by a pit bull on November 8, clutched his daughter’s stuffed animal Saturday as he cried into her white casket. Around 500 people packed Zion Cathedral Church in Freeport, L.I., and joined the dad, Tramel Dunston, as he mourned the short life of Amiyah Kayla Dunston. Family had to pull Dunston away from the casket. He held a stuffed giraffe under his arm. 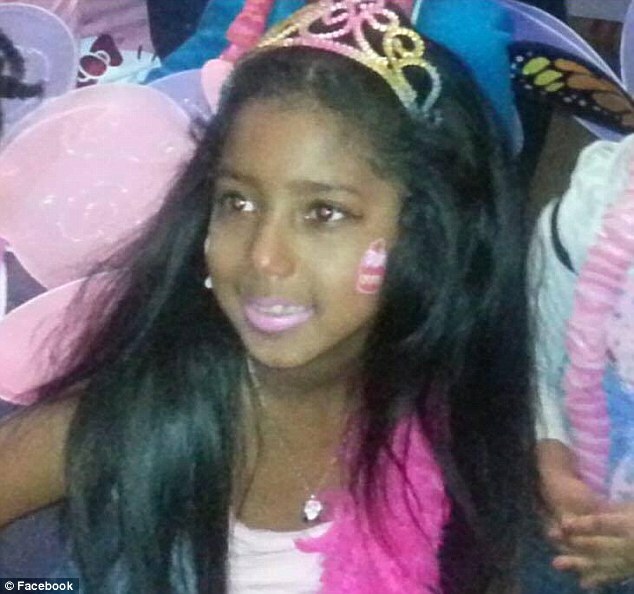 His daughter was buried in a pink dress wearing a tiara. The sad ceremony was filled with imagery describing Amiyah as a princess. The program included a heartbreaking essay by Amiyah imagining her life 20 years in the future. Her casket was loaded into a glass carriage pulled by two white horses. “It doesn’t seem real that you are gone, Mimi, I don’t want to accept it. We love you beyond words and we’re sick without you baby,” she said. Mark Gray, Amiyah’s principal at Plaza Elementary School in Baldwin, said she was adored by her teachers. “When she walked into a room, she filled it up with joy with a smile that would light up the room on the darkest days, a smile you could never catch her without,” Gray said. Amiyah was playing with two friends in a fenced-in backyard with the dog last week when it went berserk, witnesses told the Daily News. The powerful pit bull, named Kane, charged one of the cops who arrived on the scene. The officer opened fire and killed the dog. The pit bull’s owner, Carlyle Arnold, 29, was arrested on an unrelated charge of violating an order of protection. Kane was dirt napped after it killed a beautiful human being. Kane should never have been born. Amiyah should never have been killed by a pit bull. Pit bull apologists want to paint people that support Breed Specific Legislation as some kind of monsters. That their pit bulls would be ripped from their homes and executed right in front of them. In reality, pit bull apologists are the monsters for not allowing Breed Specific Legislation. All we are asking is that pit bull owners be held to higher standards. It's not too much to ask. No father should be pulled away from his daughter's casket. No parent should bury their child because it was killed by a pit bull. It has happened at a sickening rate this year. Too often, the owners of pit bulls are not charged with a crime because OUR LAWS ARE TOO LAX when it comes to pit bulls. Since pit bulls have been given GOD status thanks to pit bull apologists, they cannot be discriminated against in many states. Therefore, they are treated like regular dogs that don't kill people on their first attack. Pit bulls get the benefit of our backward legislation, which means they have to be determined to be vicious first, and then the owners are held liable. That is exactly the way the pit apologists want it. They don't want the ownership of these deadly dogs to have any repercussions for them, or their cohorts. I agree...this is happening too much to innocent children. Only a monster would kill a child. I am so saddened by what happened to this beautiful girl. I will forever be saddened by this and I don't know this family. But I feel like she is my own child....this could be anyone's child. I have cried everyday since this happened. No parent should have to bury a child like this. Please people control your animals! Keep them locked up on a leash away from innocent people This is not right! I agree...only a monster would kill an innocent child. I am tired of hearing stories like this. It breaks my heart. I am forever saddened by what happened to this beautiful little girl. I feel like she is my own child. This could be anyone's child. She did not deserve this and no parent should have to feel this pain. I wish Pit Bull, Rottweiler owners would understand that these animals snap and are not friendly to everyone. Keep these monsters secure on a leash fenced up away from innocent people. This is not right!